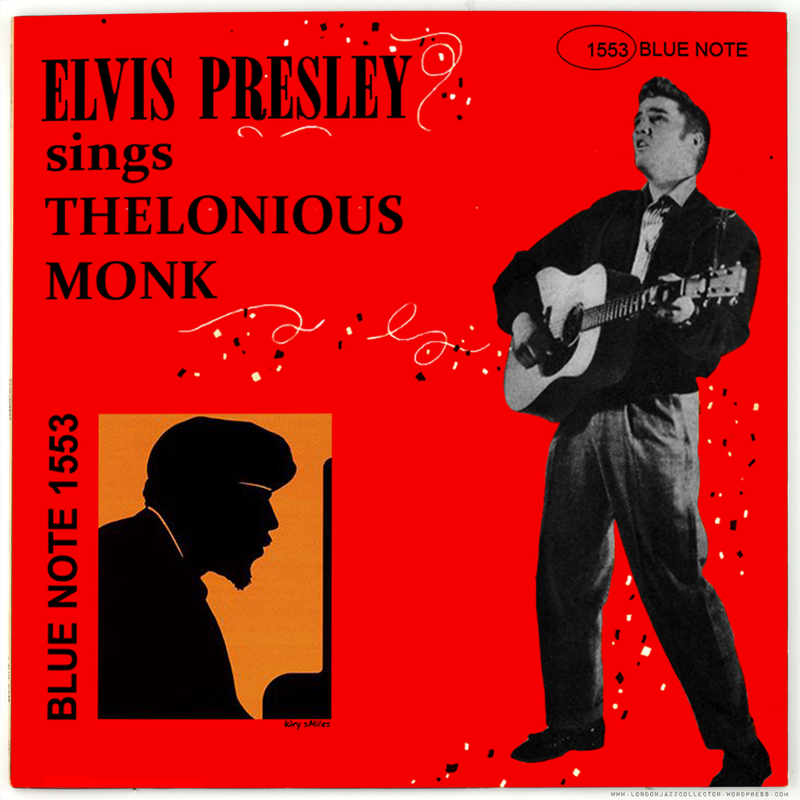 Following previous year’s discovery of the missing Blue Note LP 1553 Elvis Sings Thelonious Monk (pictured right), another early career move of the fledgling ex-army GI Elvis Presley has come to light in an extraordinary find, in a Southside yard sale of the effects of recently departed sound engineer, Henrik Van Krankenhaus. Van Krankenhaus was active in the jazz and avant guarde recording scene of New York and Chicago in the mid ’50s. His master signature stamp HVK is found on many recordings of the period, and he was a logical choice as engineer for a most challenging recording assignment from Saturn Records Inc.
Sun Ra was looking to establish a new genre at this crucial time when extraterrestrial Jazz-Soul-Bop met head-on with Crooner Pop – a fusion which he termed Space Doo-Wop-a-Lula. 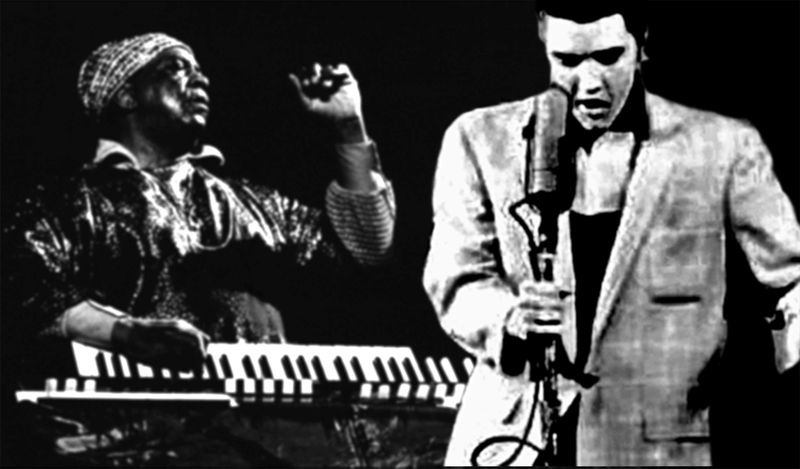 The recording session was give a working title Elvis Digs Saturn (and Other Planets), on JCB Records – and was planned for final release as “Elvis Meets The Arkestra”, however this final title floundered on inability to agree contractual arrangements and royalty shares. Sun Ra had even gone as far as to sound out the potential for endorsement for the recording by US Space Administration, NASA. In passing, NASA had been surprised to learn that Saturn was an already inhabited planet, swiftly cancelling their planned Saturn-probe, fearing future complaints of invasion of privacy. Saturn executives present during the recording session were not convinced that the record-buying public was ready for the Space Doo-Wop-a-Lula concept, and at the time Elvis was said to look uncomfortable crooning Space Is The Place, Lil’ Darling, and called all his lip-curling skills to manage “You ain’t Nuthin’ but a Space-dog, Uh huh!” . The session tape was quietly shelved. According to rock memorabilia experts and auctioneers Sotheby and Co. the combined Space Doo-wop-a-Lula stash could fetch upwards of $10 million dollars. In bringing the find to auction, to whet collector appetite, Sothebys have released a few minutes of the tape, in which they claim Elvis can be heard faintly in the background, clearing his throat and preparing to sing, in the closing bars of the tape, before the sound breaks up. All of the artefacts of the sessions can be viewed in person at Sotheby’s Auction rooms, 34-35 New Bond Street, London W1, by personal appointment. Sotheby’s of London and New York have appointed LondonJazzCollector as agent for the auction of this unique collection of Space Doo-wop-a-Lula memorabilia. Readers are are invited to register for the online auction, which will commence precisely at noon GMT, 1st April, with live links to their New York, London and Tokyo salerooms. Collectors interested in bidding will be required to provide full bank and credit card details (including security codes) prior to auction. Bid with confidence at LJC Auctions. More exciting records to come, only from LJC. This entry was posted in Elvis, Sun Ra and tagged April 1st, Space Doo-Wop-a-Lula by LondonJazzCollector. Bookmark the permalink. I believe this is a repeat of last year, nearly! Umm..last year was 3D printer downloadable vinyl Blue Note. Is that similar? For an alternative here’s something else I prepared earlier. Hmm. 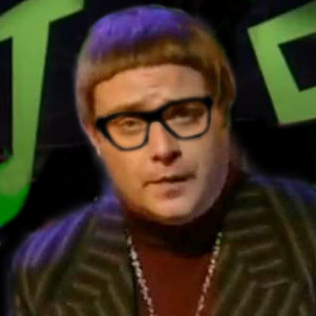 Perhaps a few years back with the long lost Elvis/Monk album. if memory serves, “krankenhaus” is german for “hospital”. any coincidence there? i always look forward to april fool’s day on LJC. Good catch, Fishy, it is indeed a hospital, I wanted something Germanic-sounding. Any resemblance to Van Gelder is entirely coincidental as I believe Rudy was of Dutch origin, it was Alfred who was German. HVK I intended to be HGV, as in Heavy Goods Vehicle, but sometimes a joke needs more time to develop than I had. Never mind, here’s to next April 1! Yes, Alun, it’s true I’ve been pre-occupied with some personal matters in recent weeks, taken priority and my attention away from writing. The water’s been a bit choppy but I can see blue skies on the horizon, plain sailing from here on, full speed a head, the LondonJazzCollector’s… umm..back in town. April fool’s day dragged you out of your hiding place. Glad to see back in full swing.